Interested? Want to know more or simply want to register for the event? Fill in the form and we will call you back. Lets talk allergy! This is the theme of our bridging the gap seminar which will be held in Port Elizabeth in September 2017. 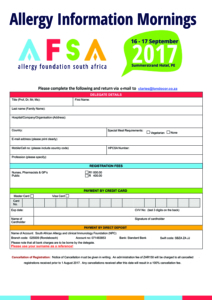 Allergies occur in about 30% of all South Africans, and are the commonest chronic diseases in childhood. 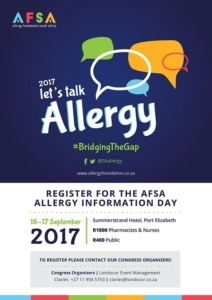 The Allergy Foundation of South Africa is bringing together top allergy experts, nurses, pharmacists, general practitioners, patient advocates and patients in a unique session to bridge the gap. Our allergy experts will discuss all aspects of allergies and also cover the basics of primary immune deficiency. 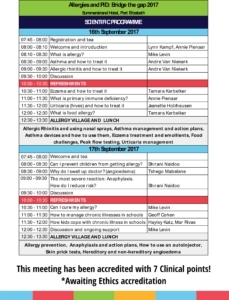 Join us to learn about what allergy actually is, about how to recognise, manage and control the common diseases.